2.5SDM2 22 3/4 HP. 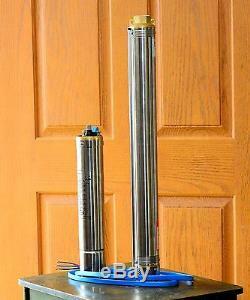 High Pressure, Deep Well Stainless Steel 2-1/2 Inch Submersible Water Pump. 3/4 HP, 2-Wire, Single Phase 220 - 240 Volt, Liquid Cooled (Oil Filled) Motor. Pump Condition Point is 9GPM & 141Ft. This is a brand new in the box 2-1/2 inch (nominal size) pump. The largest outside diameter at the cable cover is 2.669. The pump has a built in check valve and a 1 inch threaded discharge. The motor is a 2-wires motor. It does not need a control box. This is a 3/4 HP, 22 stage pump. It will deliver 6.6 GPM & 190 ft.
At its mid operating point. 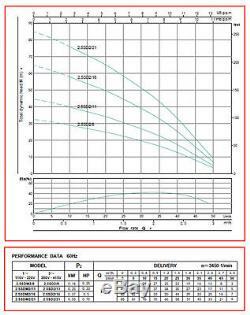 Please check the pump performance curve below for the full range of pump operation. Almost all components of this pump are made of 316 or 304 stainless steel, except the impellers (made of POM which stands for Polyoxymethylene), the diffusers made of. PC which stands for Polycarbonate. And both suction and discharge heads which are made of cast bronze. Please check the material of construction table below. Actual test results of this pump are shown in the gallery. Maximum flow of this pump is estimated at 13 Gallons/Minute. Total developed head at the shut-off condition is about 250 feet, utilizing 22 stages. The best efficiency point, this pump. The motor is single phase, 3/4 HP, 2-wire, liquid-cooled. It will run on 220 - 240 volt, 60Hz. (pump will run at 3450 rpm) - wiring and installation must be done by a. Professional electrician and a professional installer. The pump is packed in a stout cardboard box. 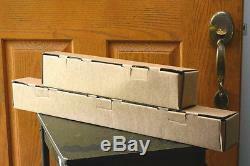 The Cardboard box is 34" x 8" x 4, and weighs in at 23 lbs. Total pump assembly is 4 ft long. Lead cable is only 7 - 9 ft (measured from the motor). Item must be complete, unused and in as new condition. Thank you for visiting my listings. The item "2-WIRE 141FT@9GPM 2.5 SUBMERSIBLE SINGLE PHASE 240V 60Hz 3/4 HP DEEP WELL PUMP" is in sale since Friday, July 14, 2017.